Problem: This older home showed evidence of water penetrating an unfinished basement. The problem has likely been occurring for years. The conditions in a wet basement or crawl space affects an entire home. To understand this, let’s first look at how air circulates in a home. - If there is water penetration in your basement or crawlspace, it increases the humidity level in your home. - The lower areas of your home are cooler, and when this humid air warms (when it comes in contact with your heating system and floors, for example). - This air rises throughout your home and escapes through the roof. - More air is drawn in from the outside and up from the lower levels as air vents into the upper levels. This airflow in your home is known as the ‘stack effect’. The continual high moisture level in your home due to your wet basement or crawlspace is the ideal breeding ground for mould and allergens (such as dust mites). We know from the stack effect that this problematic air is circulating throughout your home. This moist air not only affects your family’s health; it also affects the structural integrity of your home, energy costs, resale value and the overall enjoyment of your home. Now these homeowners are enjoying a healthier home and a clean & dry basement! Porblem: Cracks coming off windows in poured foundations are a headache. Most solutions harden over time, crack and then fail as the foundation goes through freeze/thaw cycles. Solution: Our solution stays flexible to move with the foundation. it allows the water to be controlled. I have two condo units that have leaking foundations. I'm hoping to get an estimate on repair. Spray Soundproof insulation for basement ceiling. Third week of April. Our sump pump is starting to fail and we'd like to have your recommendations as to any changes that should be made to our current set up as well as to purchase a sump pump that will meet our needs. My basement is leaking. There is a visible crack in the foundation. Finished basement carpet is wet and drainage to sump pump seems blocked. Knowledgeable, friendly and low pressure. Good job Marlon and crew! Thank you for the great job your guys did Friday. Rick was honest, courteous and not pushy. It was very well done. Extremely satisfied. Winston & Frances B. Blake St. I just wanted to pass on to you how happy we are with the work by your crew of Justin and Kevin today. Good products, pro staff, pricing was upfront. Fabulous- hard working, professional and pleasant. Basement smell is almost 100% gone, we can now use our basement as a living area. Chose you for your reputation and A+ BBB Record. Like the history of plumber. Very satisfied with job done. Good work. With heavy rain the crack did not leak. Very satisfied. Job done neatly and cleaned up afterwards. Very satisfied. Prompt, courteous service with excellent after install support. Very satisfied. Work completed in a timely manner. Went beyond expectations. Absolutely great work! Very polite did a great job. Very pleased. Kevin P. explained everything thoroughly. I was very impressed with our Technician Mike as he was very professional and he cleaned up everything in the basement. I would very highly recommend this company. Trevor showed up to the minute ! for a 9am appt. good guy, explained the work, left no mess. The crew I had in, which was lead by Kevin P., was amazing. Very professional, efficient and organized. They work looks great. Our serviceman was Mike Modde, and it must be said that his expertise of the situation and performance of the required repair were very professionally carried out and clearly explained as the job progressed. We are very confident that our problem is resolved and wish to thank your company and Mike in particular, for it's support on this project. Justin Fysh was the foreman and he was very helpful. Thank you for selling me peace of mind. I am confident my basement will no longer leak and I'm super grateful David and his crew explained to me that I can have my washer and dryer side by side. I've owned this house for 10 years and today is the day I finally have my machines side by side! "Rating Justin Fysh a 5 seems like a huge understatement. If..."
"They were polite and prompt and worked well as a team..."
"This was a particular focus for Joel. 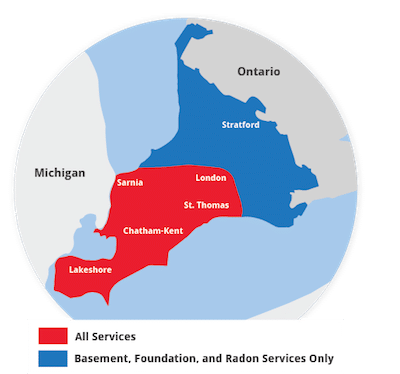 He really concerns..."
Since 2003, Advanced Basement Systems has worked hard to provide our customers in London, ON with the best in basement waterproofing and foundation repair. We understand the importance of keeping your home dry and having a foundation that is free of cracks. We adhere only to the highest industry standards and our products are designed to repair and fix your home the right way. Get in contact with us today for your FREE no-obligation estimate today! Having a wet basement can cause other problems besides just being a pain. Water seepage can cause musty odors, turn into potential flooding, and cause structural damage. Basement flooding is something no one should have to live with. Our basement waterproofing solutions range from sump pump installation, drainage systems, to vapor barrier, and more. Find out more about our basement waterproofing products. When waterproofing your basement why not install the products to give you that finished basementlook while still protecting you against water intrusion? From basement floor tiles to drywall repair systems, Advanced Basement Systems has a way to provide you with a waterproofed basement that can easily be converted to better, livable space. Maybe your basement has already been finished, but you're concerned about water and want finished basement waterproofing. We have the solution for that! Give us a call and find out how we can waterproof your finished basement today! If you find yourself in need of waterproofing or foundation repairs, don't wait any longer and get in contact with Advanced Basement Systems today for your FREE no-obligation estimate! Any leaking water is now safely diverted into the newly installed sump pump. Once the drain is installed, we will finish the area with concrete. We continue this process on all the affected areas in the basement. 100 year old house with a brick foundation I understand the pipes to the street and the street pipes have been replaced in the past, so I am assuming they are not clay pipes under the house. I will have to confirm. There is of course a dank smell in the basement. The outdoor concrete porch at our front entrance has sunk more than 6" over the last couple of years. We think that the porch is floating and not attached to the house. This has resulted in the step height to our home as being quite high and also looks unsightly. 1. We have an attached unfinished (not winterized) mud room (approx. 16 ft by 16 ft) raised 5 feet off the ground on wood posts. The room needs new footing. It is sinking up 2 inches at the end attached to the house and maybe up to 5 inches on the end furthest from the house. 2. In the crawlspace of the main house, we need some jackposts to gradually raise the centre of the main house an inch or two. 3. We have one area where the foundation could use a little inspection. I believe I need a sump pump installed in my basement. I manage a condo corporation where a unit has a large crack that requires an injection repair. Cannot access it from the outside to repair outside. I am looking for a contractor that can do this work for me. Please advise if this is something you can handle? We have a foundation leak that has been going on for quite some time. There is a bolt in the foundation that holds up our water meter and water is leaking in from that area. We need someone to come look at it for us. A couple days ago we discovered water in our finished basement. We removed some drywall to find a crack in the foundation that was lealing water. We are looking for a quote to come fix our issue and discuss what we should do. I have walking coming into my finished basement but am unsure from where exactly.